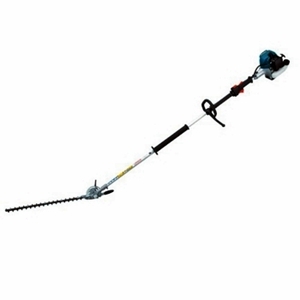 The main purpose of this site is to help you decide which type of petrol hedge trimmer you need for the work you have to get done in your garden. There are so many to choose from; for example, would you know whether you needed a long reach model or a wide tooth model? Getting the wrong type can be costly – and there is nothing more annoying than ending up with the wrong tool for the job. As you will know, any hedging normally needs cutting at least twice a year to ensure that it keeps it shape. Another consideration is that you do not want your hedging growing so tall that it casts excessive shade on your garden – or your neighbour’s. Neither do you want it growing so big that the root system draws all the moisture out of the ground making it difficult to establish border plants or keep lawn edges in good condition nearby. Or worse still, roots can encroach under paths, cracking concrete and lifting paving slabs as we found out in our own garden recently with the roots from our neighbour’s hedging on the other side of our fence! You also need to be sure you have taken adequate safety precautions before using your trimmer and that you have read all the relevant sections in the manual and are familiar with all the controls and features on the model you have chosen. In Casualty departments all over the country, you will find people who thought they knew exactly what they were doing, or lost concentration for a second or failed to wear the right protective clothing because it was a hot day or they felt it wasn’t worth changing for a ‘five minute job! 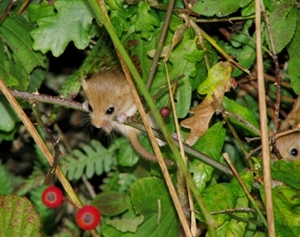 Environmentally, planting hedges in your garden is one of the best ways to provide habitat for all sorts of garden creatures. Have a look at this page on the RSPB Website which has lots of helpful information and explains why they recommend not cutting your hedge between March and August in the UK and your responsibilities to nesting birds as laid out in the Wildlife and Countryside Act of Great Britain 1981. Using a petrol hedge trimmer when you have a lot of hedging will have several advantages over an electric or cordless model. Not only do these have more power, but they get the job done more quickly and with less effort. If you have a large garden an electric model that needs a power cord for operation can be a problem on three counts. Firstly because it is not always easy to get a power source to the area of your garden where you need to work, secondly power cables can get caught in branches, tripped over – or worse still, sliced through. Lastly, electric powered machines are not suitable for using in the rain or drizzle so it restricts when you can get your gardening jobs done if you have to rely on a dry day – luckily petrol models will operate in most weather conditions that you can! 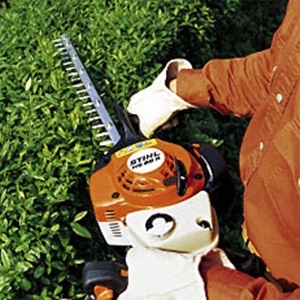 Whether your hedging is formal, shaped into topiaries or left wild to create a natural look which is just trimmed to keep it tidy now and then, you will find a petrol hedge trimmer model to suit your requirements. Look for a model with narrow teeth spacing for more formal hedges and topiary. These will not cut through really thick, twiggy growth or a tangle of brambles, but they will produce a really tidy result where you trim regularly. A small blade trimmer is particularly suitable for those tricky shaping jobs. A model with wide teeth spacing on the other hand will cut through much thicker growth – a guide is that the width of the teeth spaces is roughly equivalent to the maximum diameter of the twig it will cut. These are more suitable for wild or natural gardens where you are basically trying to keep nature in check rather than manicure it! Take a look in our reviews section as we have reviewed the Stihl HS81that comes in two models, one with wide tooth and the other with narrow tooth spacing and illustrates perfectly the difference between the two types of blade. It is worth bearing in mind though that no matter how powerful a petrol hedge trimmer is, you cannot use it like a chain saw and trying to force it to cut through branches that are too thick for it is very dangerous and could also prove expensive! If you have tall hedging or shrubs and you want to carry on doing the maintenance yourself but are not sure about whether you want to be climbing ladders or working from a height, you could try a petrol long reach hedge trimmer. Choosing the right machine that is well balanced and has articulating blades to enable you to cut the top as well as the sides will make life a lot easier and enable you to stay safely on the ground. When researching this type of petrol hedge trimmer, look under the other names they are known by – pole, telescopic or long handled.